Yet unclear, was what became of Stokes’ and his projection contraption. Aside from the patent, references to Stokes’ origins and biography were scant, and Auroratone proved remarkably absent from scholarship on experimental film, expanded cinema, and film history in general. (Even the connection between bunnyhatter’s suggestion and Stokes’ mechanistic invention seemed tenuous, as the term “Auroratone” fails to appear in the text of Stokes’ patent.) Why did Bing Crosby’s voice accompany images that in some other era – say, the 1960s – might screen to a bunch of drugged-out dancing hippies at Bill Graham’s Fillmore Auditorium? 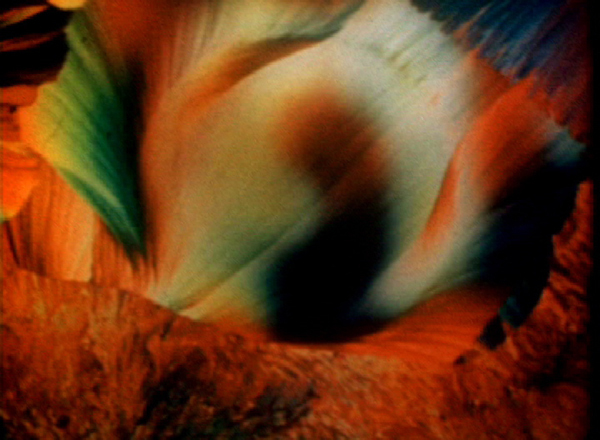 How exactly did images generated by Stokes’ elaborate light machine end up on 16mm Kodachrome film stock? And, why did Gus Martens, a Queens soda pop distributor, possess the only-known Auroratone print? This exhibition history attempts some answers. Archery Antics is nearly as mysterious as the Auroratone itself. Yet, Robert’s mention of the two films’ provenance connection revealed a common thread between the Auroratone and “psychodramatic” films shown to psychiatric patients during World War II. Made by the sponsored film producer Don Robert Catlin, the nine-minute Archery Antics opens with (as the narration describes) “a shady lagoon, a swing, a beautiful girl, and a roving archer,” played by the world-famous archer Ande Vail. After Vail bullseyes a red balloon attached to the buxom female’s toe, the couple engages in a host of exhilarating acts: target practice, match-lighting, and feasting on an elaborate spread of picnic food. “I’ll bet they don’t feed you this good in the army,” the narrator speculates. 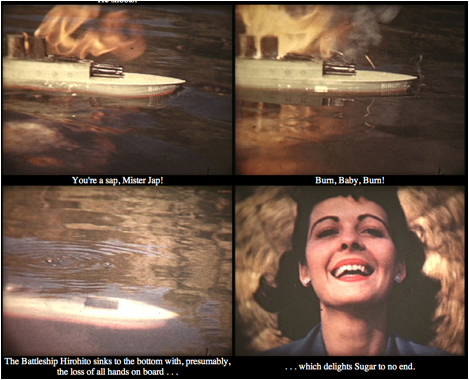 The film ends – insanely – with an alarming periscopic close-up of a toy battleship floating in a nearby pond, emblazoned with the Japanese flag and the name “Hirohito.” In a drawn-out tension-filled finale, Vail shoots an arrow sinking the boat in a fiery flurry, while Rossini’s thundering “William Tell Overture” climaxes on the soundtrack. Well, during the 1940s, Gus did supplement his income with a part time job showing movies to patients in mental institutions. He and a friend would take rented movies and a projector with them in a car to the institution, set up the projector in a convenient room, and give the show. As per my father's recollection, Creedmoor Psychiatric Center in Queens, New York was definitely one of those institutions he visited. Indeed, medical literature reveals that Stokes’ Auroratone technology figured notably in psychiatric healing, largely through the work of the army psychologists Dr. Herbert E. Rubin, Captain, M.C. and Dr. Elias Katz, 2nd Lt. MAC. Results of their testing, first published in 1946, detailed Auroratone’s ability to stimulate intense relaxation, weeping, and emotional catharses in patients that enabled them to speak freely with psychiatrists immediately after screenings – conceivably, the kind of visual soothing required by patients witnessing Vail’s tense “defeat” of the Japanese navy. So effective were Auroratone’s patterns of light and music, that Katz and Rubin posited that sensitivity to aesthetics was an instinctual vestige that could transcend psychoses. Auroratone prints found their way into these experimental testing milieus thanks to the establishment of the Auroratone Foundation of America (AFA) in March of 1944. A California state non-profit, the AFA’s stated mission was to discover, “new and improved methods of lessening mental and physical tensions in the shortest possible time, and in natural ways,” and benevolently distributed its services free of charge. At its founding, Cecil Stokes was appointed AFA chairman, Bing Crosby became Director of Music Research Experiments, and Mary Pickford was cited amongst its original board members. 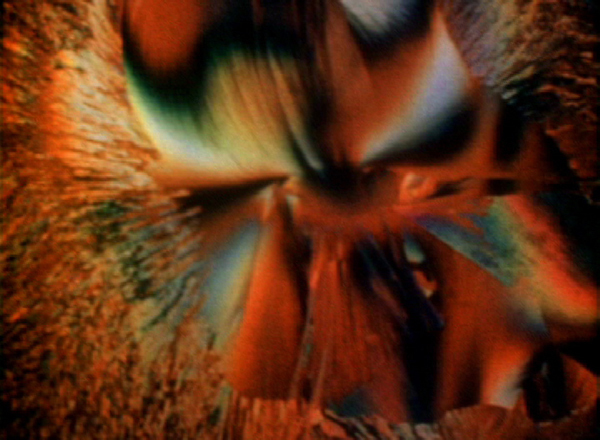 Crosby’s affiliation with Stokes provided soundtracks with which to generate Auroratone’s crystal patterns, and his fiduciary liens enabled the initial creation of film print versions of Stokes’ projected patterns, for wider dissemination. While the partnership may seem initially outrageous, Crosby’s colossal wealth as America’s preeminent entertainment personality would deeply impact the development of experimental media, even subsequent to his involvement with Stokes’ Auroratone. Bing Crosby Enterprises (BCE), headed by Crosby’s brother, Larry, saw major shareholding investment of Crosby’s cash in a strange array of banal business collaborations, including: special window-sash holders, automatic coffee dispensers, Minute Maid frozen orange juice, and the Pittsburgh Pirates baseball club. But, Crosby also supported funding of the U.S. Army Signal Corpsman Jack Mullin’s experimental research with magnetic audiotape plundered from the Nazis – technology which enabled Crosby to pre-record, overdub, and easily edit his radio show. This latter investment would forever transform the industry of recorded sound and, in 1956, resulted in the first commercial release of videotape – at the time, perhaps, an equally far-fetched parallel effort at technologically converting sound into moving images. L to R: Advertisement from the Chicago Tribune, June 22, 1945, 7; advertisement from the Winnipeg Free Press, September 18, 1947, 16. 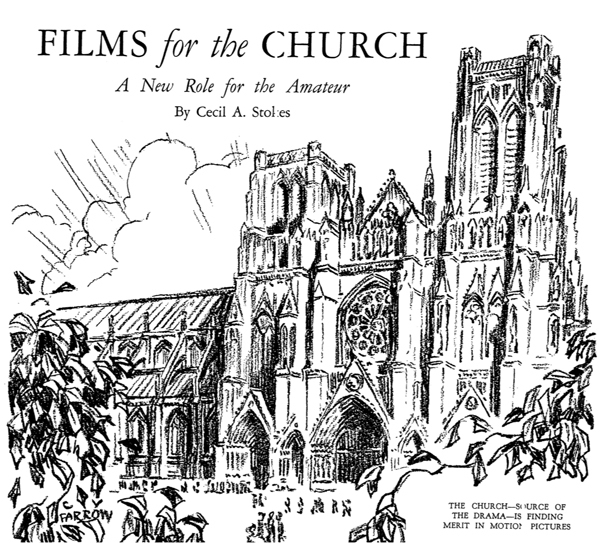 Illustration for Cecil A. Stokes, “Films for the Church: A New Role for the Amateur,” Amateur Movie Makers 2, no. 9, (Sept. 1927): 18-19. L to R: Advertisement from the Los Angeles Times, December 27, 1941, A2; advertisement from the Los Angeles Times, February 27, 1943, A3. Gus Martens’ original 16mm 1943 Kodachrome Auroratone print, and a new preservation internegative, are now part of the collections of the Academy of Motion Picture Arts and Sciences – an appropriate L.A.-based home for Cecil Stokes’ curious para-cinematic invention. 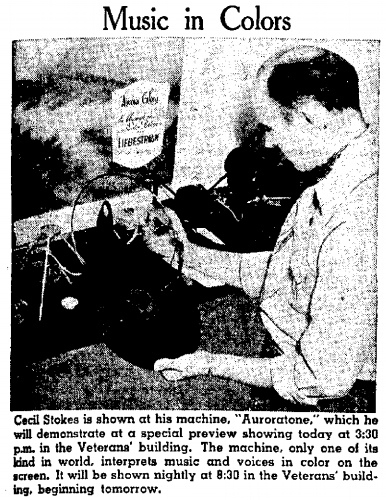 While still checkered by puzzling ambiguities, I want to conclude this germinal attempt at a history of Auroratone with a metaphoric image: the only known photograph to survive of Cecil Stokes (perhaps, holding one of Auroratone’s crystalline glass slides) – a high-contrast and blotchy microfilmic swamp – from the October 21, 1941 issue of the Long Beach Independent, where it publicized Auroratone’s debut. This research is dedicated to Kathleen Maguire, who first introduced me to Auroratone. Special thanks to Robert Martens, Dan Streible of the Orphan Film Project, and Ralph Sargent at L.A.’s Film Technology who generously provided in-kind film preservation for the “When the Organ Played ‘O Promise Me’,” in 2012. 1. James Peel, “The Scale and the Spectrum,” Cabinet 22 (Summer 2006). 2. 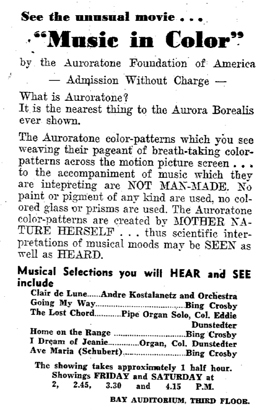 “Auroratone New Visual Delight,” Bakersfield Californian, February 14, 1944, 4. 3. 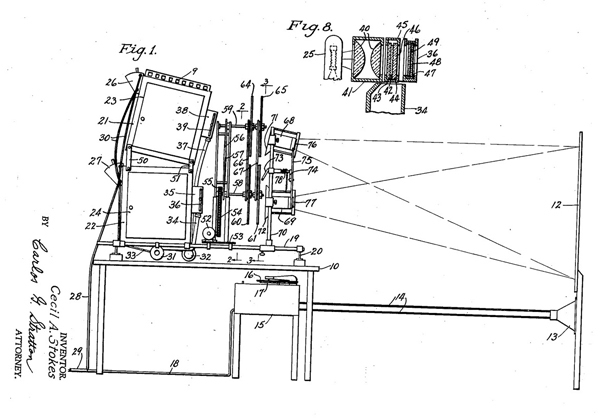 Cecil A. Stokes, “Process and Apparatus for Producing Musical Rhythm in Color.” Patent 2,292,172. 4 August 1942. 4. “Music In Colors,” Long Beach Independent, October 21, 1941, 17. 5. John Sonderegger, “Lightshow Slides Part A – The Crystal Effect,” 2005. 6. Howard P. Rome, “Therapeutic Films and Group Psychotherapy,” Sociometry 8, no. 3-4, Group Psychotherapy: A Symposium (Aug.-Nov., 1945): 247-254. 7. J.L. Moreno, “Psychodrama and Therapeutic Motion Pictures,” Sociometry 7, no. 2 (May, 1944): 230-244. 8. Herbert E. Rubin and Elias Katz, “Motion Picture Psychotherapy of Psychotic Depressions in an Army General Hospital,” Sociometry 9, no. 1 (Feb. 1946): 86-89. 9. Ralph Dighton, “Color Music Eases Raveled Minds,” The Washington Post, December 5, 1948, L3. 10. Ibid. ; “‘Auroratone,’ New Form of Art, Used in Insane Asylums,” Dixon Evening Telegraph, December 2, 1948, 8. 11. Richard E. McKenzie and Fred Kassner, “The Use of Auroratone Films as a Psychotherapeutic Agent with the Mentally Deficient,” Michigan Academy of Science Arts and Letters, Vol. XXXVII, 1951 (Ann Arbor: The University of Michigan Press, 1952): 497-504. 12. 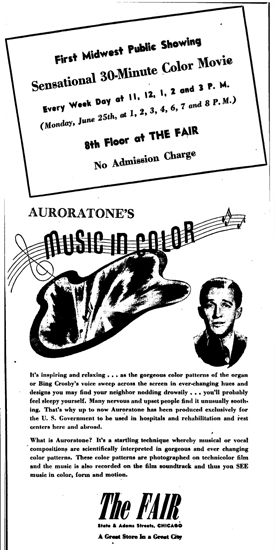 “Make Color Out of Music,” The Hutchinson News-Herald, November 28, 1948, 12. 13. Auroratone Foundation of America. Number: C0194321, Incorporation date: 3/1/1944, Domestic Nonprofit, Van Nuys, CA 91402. 14. Alexander Jones, “Auroratone, Wonder Instrument,” Rays from the Rose Cross: A Magazine of Mystic Light (Rosicrucian Fellowship, 1950): 65. 15. Cecil Stokes letter to Hilla von Rebay, December 30, 1947; “Music Creates Visual Impression, Magazine Says,” Wisconsin State Journal, October 15, 1944, 16. 16. Indeed, Crosby’s investments were so wildly diversified that Judy Schmid, publicist for the Bing Crosby Archive, told me: “Some of the things that Bing Crosby Enterprises invested in back in the 40s were never physically in Bing's possession, and may never turn up,” (e-mail message to author, September 28, 2011). 17. Malcolm Macfarlane, Bing Crosby: Day by Day (Lanham, MD: Scarecrow Press, 2001), 273. 18. “Ulcer Cure in Color-Tunes: Bing Crosby, Ginny Simms Aid Treatment,” The Sandusky Register-Star News, August 30, 1948, 5. 19. “Bing Crosby Starts Studying Chinese,” Bakersfield Californian, June 28, 1945, 11. 20. “Ulcer Cure in Color-Tunes: Bing Crosby, Ginny Simms Aid Treatment,” The Sandusky Register-Star News, August 30, 1948, 5; Margaret Turner, “The Women’s Angle,” Lubbock Morning Avalanche, August 30, 1945, 4. 21. “Auroratone New Visual Delight,” Bakersfield Californian, February 14, 1944, 4; “Tickets Sell Well for Benefit Film,” Bakersfield Californian, March 8, 1944; “Auroratone Showing Planned by Art Group,” Los Angeles Times, March 14, 1949, 7; “Dr. 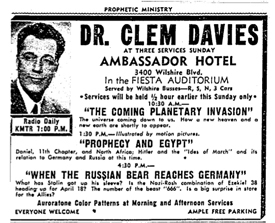 Bietz Will Close Series,” Los Angeles Times, May 8, 1949, C3. 22. “In Long Beach Art Circles: Music, Color ‘Marriage’ to Be Demonstrated Here,” Long Beach Press-Telegram, February 14, 1945, B12. 23. Laura DeWitt James, “The Color Trail,” Rosicrucian Digest (1944): 37. 24. Advertisement, Los Angeles Times, August 15, 1943, 7. 25. 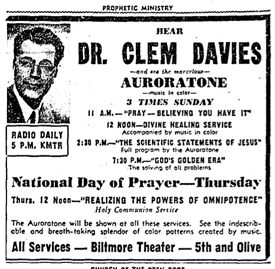 Advertisement, Chester Times, September 11, 1945, 11. 26. Advertisement, Los Angeles Times, May 19, 1947, A3. 27. Advertisement, Winnipeg Free Press, September 18, 1947, 16; Herbert E. Rubin Captain M.C., Elias Katz 2nd Lt., MAC, “Auroratone Films for the Treatment of Psychotic Depressions in an Army General Hospital,” Journal of Clinical Psychology 2, no. 4 (Oct. 1946): 333-340. 28. Advertisement, Chicago Daily Tribune, June 22, 1945, 7. 29. Caitlin McGrath “This Splendid Temple: Watching Films in the Wanamaker Department Stores,” (presentation at Northeast Historic Film’s Ways of Watching conference, (Bucksport, Maine, July 24-25, 2009); and, Liz Czach, “Travel Lecture Filmmaking in the Post-War Era” (presentation at Northeast Historic Film’s Wunderkino 2 conference, Bucksport, Maine, July 27, 2012). 30. “Auroratone Showing at School Tonight,” Bakersfield Californian, March 9, 1944, 1. 31. Cecil A. Stokes, “Films for the Church: A New Role for the Amateur,” Amateur Movie Makers 2, no. 9, (Sept. 1927): 18-19. 33. Anne Morey, Hollywood Outsiders: The Adaptation of the Film Industry (Minneapolis: University of Minnesota Press, 2003), 117. 34. Patricia R. Zimmerman, Reel Families: A Social History of Amateur Film (Bloomington: Indiana University Press, 1995), 108. 35. Advertisement, Los Angeles Times, December 27, 1941, A2; Advertisement, Los Angeles Times, February 27, 1943, A3. 36. “Southland Plans Easter Pageants,” Los Angeles Times, March 29, 1942, A2; Advertisement, Hayward Review, December 21, 1943, 4; “Notes on Long Beach Church Activities,” The Independent, June 20, 1947, 20. 37. David E. James, The Most Typical Avant-Garde: History and Geography of Minor Cinemas in Los Angeles (Berkeley: University of California Press, 2005), 4, 13, 145. 39. Robert C. Welden letter to Hilla von Rebay, November 27, 1947. 41. Cecil Stokes letter to Hilla von Rebay, December 30, 1947. 42. Hilla von Rebay letter to Cecil Stokes, January 5, 1948. 43. “Effects May Be Many: Color Music Puzzles Inventors, Aren’t Sure What They Have,” News and Tribune, November 28, 1948, 18. 44. “Reno Churchmen to Record Sound in Color Film,” Reno Evening Gazette, September 13, 1955, 15. 45. Ralph Dighton, “Color Music Eases Raveled Minds,” The Washington Post, December 5, 1948, L3. 46. Laura DeWitt James, “The Color Trail,” Rosicrucian Digest (1944): 26-27. 47. As suggested in: Alexander Jones, “Auroratone, Wonder Instrument,” Rays from the Rose Cross: A Magazine of Mystic Light (Feb. 1950): 65-71.